Residence on Francis Quadrangle - University of Missouri - PWArchitects, Inc. The renovation of the interior and the design for accessibility of Residence on Francis Quadrangle included a new elevator tower to match the existing building. Over one hundred and thirty-five years ago this residence was built to house the Chancellor of the University of Missouri–Columbia. Today it is one of the oldest standing buildings on the campus. Despite several additions that provided much-needed improvements to electricity, air-conditioning and more living space, the building was underutilized for years due to its failure to comply with the Americans with Disabilities Act (ADA). PWA was asked to design a new elevator tower to be built next to the original residence that would integrate seamlessly with a simultaneous historic restoration of both the interior and exterior of the building. 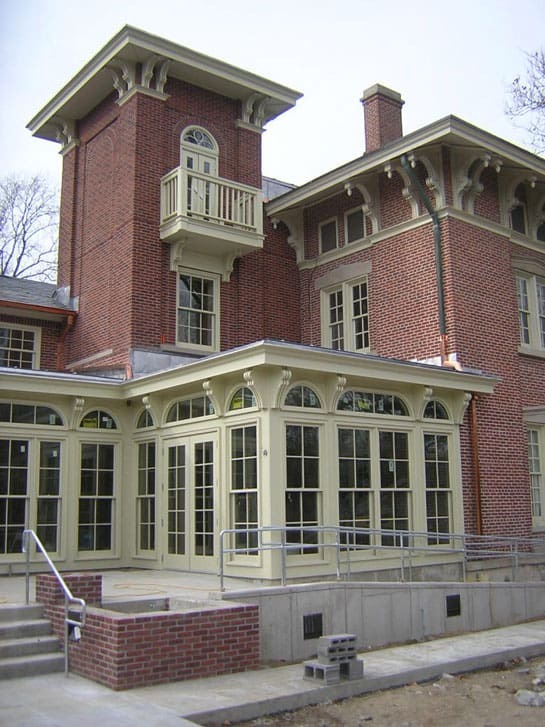 In addition to blending the appearance of the new construction, the architects’ design also aimed to protect both the original building and its status as a part of the Francis Quadrangle which is listed on the National Historic Register.